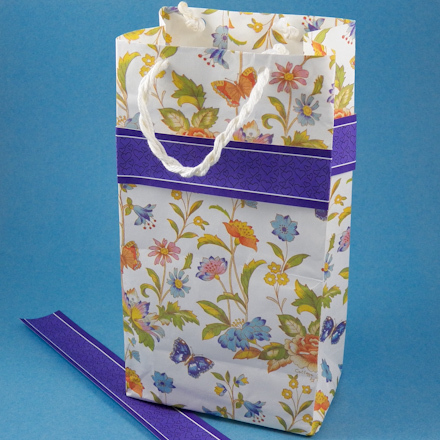 In this project, you will see how easy it is to make reusable gift bags from wrapping paper. 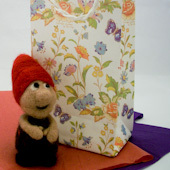 With this simple technique, bags can be fashioned in just the right size for your gift. You will simply use a stack of books or boxes as a form for the bag's base. Wrap one end of the form like a box, and remove the form to reveal your bag! 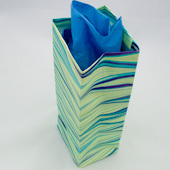 This is the first in a series of craft projects on gift-wrapping that focuses on making your own boxes and bags in a variety of shapes and sizes. 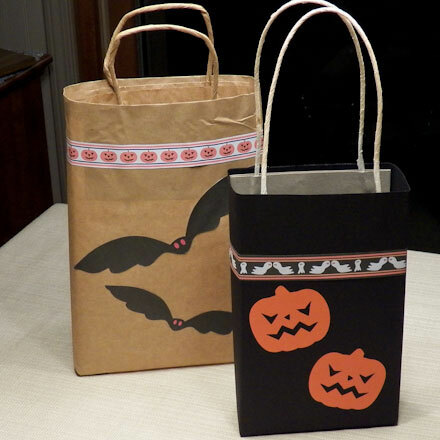 Related craft: To see how to add a sturdy twine handle to the top of a gift bag, checkout the Halloween Trick or Treat Bags craft project. Cut a sheet of wrapping paper to use in making the bag. In one direction, the paper should be the desired height of the bag plus 3/4 of the bag's depth, plus 1 inch extra (2 cm). In other words, the paper measurements should be the height of the bag plus enough paper to fold over the end of the stack of books, plus 1 inch. In the other direction, the paper should wrap around the stack of books, with 1/2 inch extra (1 cm) for overlap. Make the bag stronger by reinforcing the bottom with a piece of cardboard cut to size and placed in the bottom of the bag. To add a ribbon to tie the bag closed, punch two holes in the top of the bag, while holding the front and the back together. Thread ribbon through the holes. Make the holes stronger by adding notebook reinforcing rings. 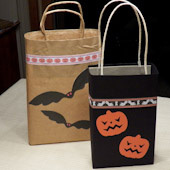 Tip: For a way to add sturdy handles, see the Halloween Trick or Treat Bags craft project. 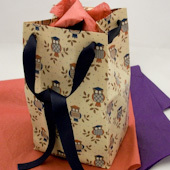 If you used solid-colored wrapping paper, you may want to decorate the bag. You can color it, stamp it, or apply paper cuts. Make your own paper cuts, or print one of these Scottie dog or flower appliqué sheets. For more paper cut sheets and how to use them, see the Simple Paper Cutting craft project. All of Aunt Annie's Crafts project patterns are designed to be printed on standard letter-size paper (8.5"x11" or A4). When printing from Adobe Reader, you may need to select Auto-Rotate and Center or Choose paper source by PDF page size to ensure the best fit. Tip: For small gifts, sheets of decorative paper can be used to make gift bags. Tip: Ribbon threaded through punched holes can be used to tie a bag closed. Tip: Decorate gift bags with paper ribbons like this Pen 'n Ink Hearts Paper Ribbon or other paper ribbon downloads from Aunt Annie. 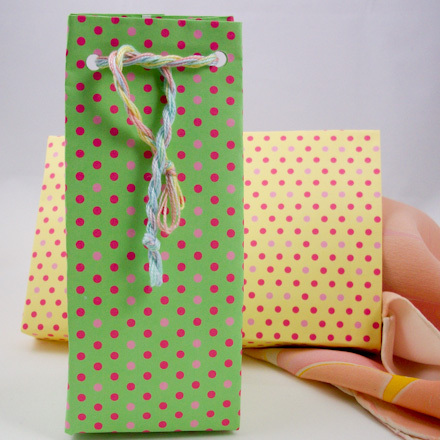 Tip: These gift bags are made from Pink Lemonade ePaper and Pink Limeade ePaper. Browse Aunt Annie's complete collection of ePaper digital downloads. Tip: Adapt the technique used to make Easy Gift Bags to create Halloween Trick or Treat Bags from construction paper or brown craft paper. See how sturdy handles are added to these bags.